But the main characteristic, and the one that it is most well-known for, is that it is centered on the analysis of charts at multiple timeframes. The crux of Elder’s triple screen is that it tries to time the entries to coincide with temporary market corrections or pullbacks. These can occur in both bull trends and bear trends. The strategy only buys or sells the market when the signals between different screens at different timeframes are in agreement. Here we’ll look at a simplified triple screen strategy with worked examples. The first step is to choose which charts to use. Most traders who use triple screen choose a time ratio of between 3 and 5. This means that the period of each chart reduces by a factor of 3, 4 or 5 from the longest duration chart to the shortest duration chart. If the long range chart is the weekly, we divide by 5 to get the tactical chart, then by 5 again to for the executional chart. If the exact period chart doesn’t exist on applying this rule, the closest one is used. See the table above. Choosing the right chart set depends on your trading goals. If you are a buy and hold, or sell and wait trader, then a longer range setup is perhaps going to be the best choice. Someone who trades intraday on the other hand would be looking at the short range set of charts or lower. To identify the entries Elder’s original system used a combination of MACD and the Force Index, which are types of momentum oscillators. In practice though there are a variety of other indicators that will do the same job, and work equally well or better. 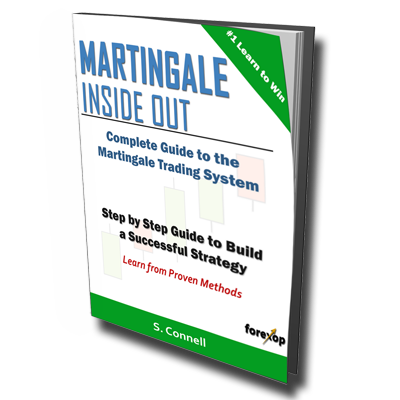 Timing is everything with most strategies, and this one is no exception. Triple screen doesn’t have a definitive buy or sell signal. It works as a system of confirmations from one time frame to the next. This is done such that the evidence points to a suitable time to enter a trend in the likely direction the market is moving. This can be both a good thing and a bad thing. Because while there are no rigid criteria, this does mean you can incorporate your own thinking into the strategy. It also means you can make it simpler by using fewer indicators. The time to buy in the triple screen is when a bull trend has just undergone a correction and is beginning to turn up again. To identify this, first pull up the longest range screen – in this example we’ll use the weekly chart. We then look for several markers. The trend: Check the 50-week simple moving average line to confirm the trend. In this particular chart we see the general direction of the trend is bullish. 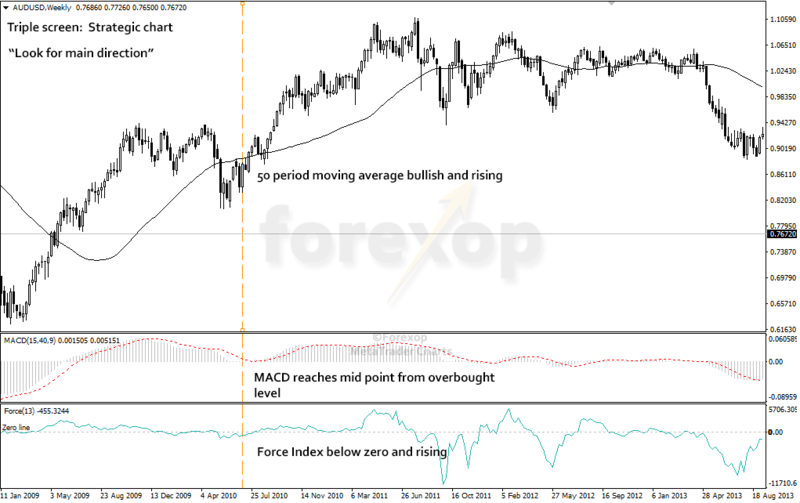 The pullback: Next, check or wait until the MACD line has descended from the oversold position and the slope of MACD is starting to turn upwards again. Next, check that the Force Index is below the zero line. Instead of the Force Index the RSI, Momentum or Williams’ Percent Range will do just as well. Next we need to check the middle chart, and in this example it is the daily chart. 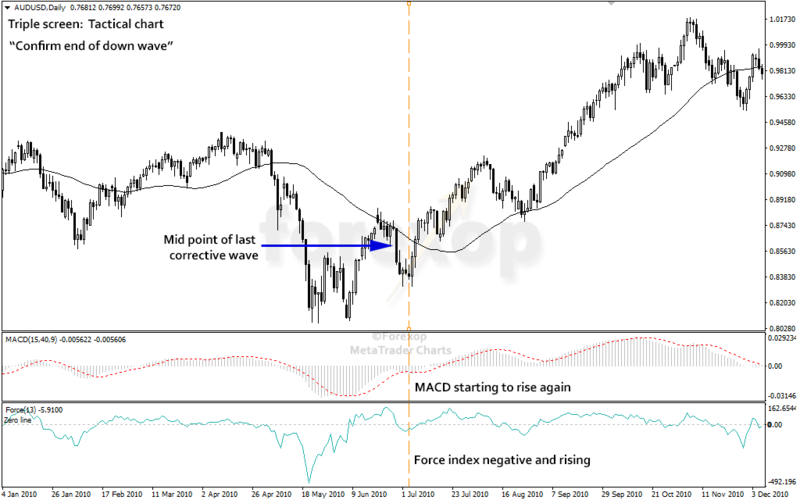 Momentum: Using the Force Index, MACD or both we look at the chart to confirm if the correction is completing. What we are trying to determine here is that the downward selling pressure from the correction is reducing. This means the flow of profit taking and other sell orders has hit a peak. It’s essential here as well that we check to confirm this isn’t the start of a new bear market. If the downward correction is particularly strong, caution is required. We’d certainly want to wait until the new direction establishes itself for entering long if the pullback is especially sharp. Finally, pull up the executional chart which is the 4-hourly chart in this case. On this chart we’re looking for the optimum time to execute the buy to open order. That means we look for evidence that the pullback is completing and the market is reaching an oversold point on this time scale. The orders are then placed as pending buy stop orders. For a buy entry, a pending stop order will execute only when the price rises above the current market level to the stop in level. Once we decide on that entry, we place a pending buy stop order at that level. This level should be chosen to be about mid-way between the top and bottom of the corrective down wave. In this example for AUDUSD that works out at about 0.8618. This pending order works such that if the market falls the order cancels and we do not enter the trade at all. 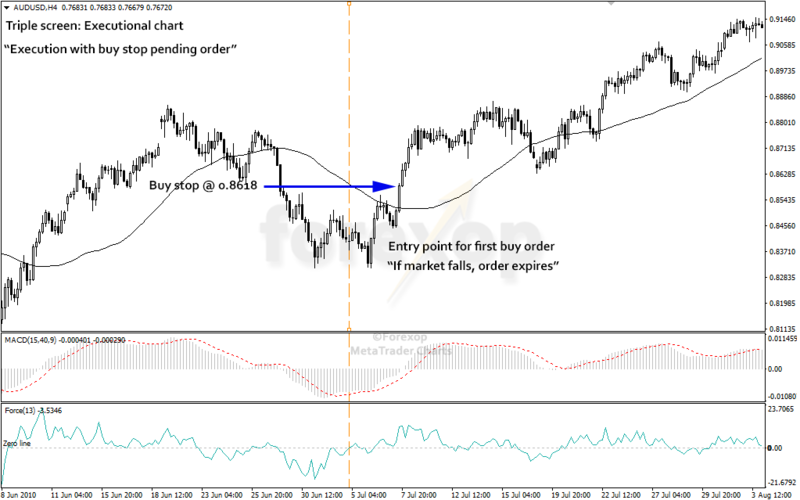 If the market starts to rally and rises above our entry point, the order automatically executes and we enter long. With each buy signal triple screen creates, we accumulate the entire position up to a pre-defined risk limit. Normally there isn’t any take profit defined for each order. Instead, a ratcheting stop loss or trailing stop loss is set. For a buy order, the exit stop loss is gradually moved upwards as the market rises. This is done to lock in the profit. 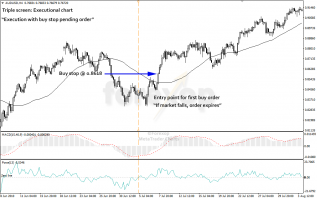 The stop loss for a buy order can only move higher and is never moved lower. Once the market drops by the loss amount the order is automatically stopped out and that results in either a profit or a loss being realized. The loss amount and the order sizes are set according to the desired risk limits. The procedure on the sell side is identical to the above except in reverse. Instead of buy stop orders, we use sell stop orders. A trailing stop loss is set on the sell order to exit the position with a buy back either in loss or in profit. The triple screen is a trend follower; and like the Turtle system it works best when diversified across several different markets. This means that a proportionally small amount is risked per trade but many trades are completed across different, non-related markets. This way risk is spread and the system won’t collapse when one or two trades end up going the wrong way, which they surely will. Triple screens always intimidated me but the way you describe it here, it is far easier to understand. I have to say, this is the first forex site that makes sense, I have been working these details on my own. Thanks.